1. 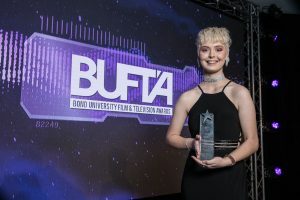 How did you hear about BUFTA and why did you decide to enter the competition? I had gone to multiple open days for different Universities that offered a Bachelor of Film and Television course and then I heard about Bond through a social media advertisement. I researched further into the university and found that they were hosting screenwriting and cinematography workshops. I attended the cinematography workshop and I found that the university had a real welcoming and community feel to it that other universities didn’t have. So when I heard about BUFTA I knew I had to take the opportunity. 2. What was the most rewarding experience you gained from the BUFTA experience? Many people would think that winning the scholarship would be the most rewarding part, but for me it was putting my whole heart into something I’m passionate about. From the pre-production planning, to the seemingly endless hours of filming, to trying to piece everything together in post. I always struggled with creating an engaging plot so I spent hours thinking about every little detail and what I could do to create a unique storyline. Once it all came together, I felt like I achieved something within myself. 3. What is your favourite film genre and why? Crime is my favourite genre because it displays experiences that I probably won’t encounter in my own life. If you look at the films Pulp Fiction (1994, Tarantino), No Country for Old Men (2007, Coen) and Trainspotting (1996, Boyle), they all come from the Crime genre, but they are all so different with their story and style. For one genre, theres so much variety in storytelling and that’s why I find it so interesting. 4. How long did your film ‘Cue Overreaction’ take to make from start to finish? Overall it was around 9 months – I first had my ideas late December 2017 and I finished editing late September 2018. 5. What is your ultimate career goal? To become a successful Cinematographer. But ultimately, work alongside directors like Quentin Tarantino, Wes Anderson and David Fincher. 6. Do you have any advice/tips and tricks for future BUFTA entrants? Don’t waste your time making heaps of films to enter into BUFTA because you think the more films you have, the better chance of winning. Put 110% into an idea you’re really passionate about, instead of putting only 25% into 4 or so films. You’ll just overwhelm yourself and then you’ll forget about the little details that could’ve made one of your films incredible. Quality over quantity.